On Monday the murder trial of Oscar Pistorius entered its sixth week, with Pistorius himself taking the stand for his fourth day of cross-examination. It turned out to be his toughest day yet, as the pugnacious prosecutor Gerrie Nel — known as the "pit bull" — repeatedly tore into Pistorius. 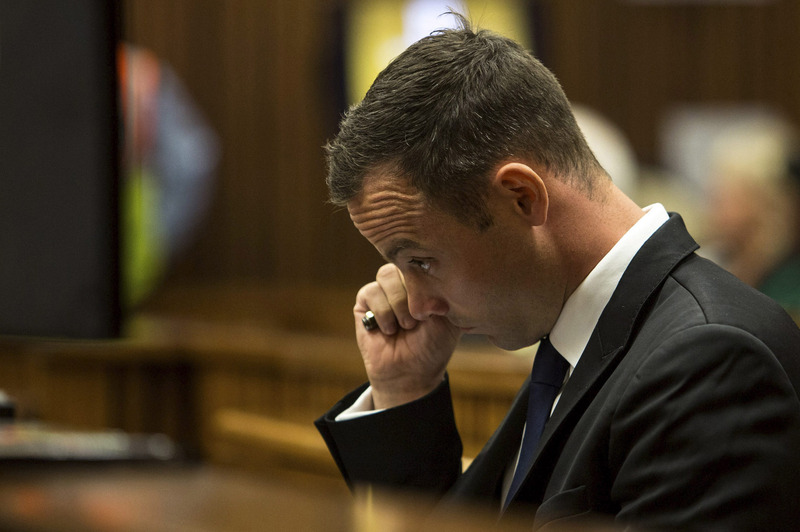 "I did not fire at Reeva," Pistorius wailed at the prosecutor. Nel dug right down into the details of Pistorius's testimony, asking him for the precise details of what happened in the early hours of Feb. 14 last year when he shot his girlfriend, Reeva Steenkamp. In particular, Nel drew attention to the position of the duvet and a pair of Steenkamp's jeans in the bedroom. He asked Pistorius why they were not in Reeva's bag, where all of the rest of her belongings were impeccably packed. Nel cited this as evidence that the couple was not in fact asleep, but awake and quarreling, before Steenkamp was shot. Later, Nel repeatedly accused Pistorius of lying and "tailoring" his evidence. He pointed out several inconsistencies between statements that Pistorius has made on the stand and those made in his bail application and plea explanation. In an attempt to highlight the athlete's inconsistencies, Nel pointed out that Pistorius was now asserting that he spoke to Steenkamp in a soft voice, rather than a whisper, when he told her to call the police. Pistorius' initial statement had maintained he had whispered. "I must have made a mistake," Pistorius said. Pistorius told the court that he heard a window slamming in the bathroom, and fetched his gun from under the bed. He began walking toward the bathroom, he said, at which point he told Steenkamp to get down on the floor and call the police. Pistorius voice became louder and he broke down as he told the court that he screamed at the perceived intruders. "I screamed, I said 'Get the f--- out of my house! Get the f--- out of my house!'" Nel also dug into the reasons why Pistorius fired his gun. Pistorius said that he discharged his firearm at the door because he heard "wood moving," which he thought was someone opening the door but in retrospect he thinks was probably the magazine rack within the toilet cubicle. Nel pressed the athlete on whether he was aiming at the attacker or whether he was pointing his firearm toward the door. He asked several times whether Pistorius had fired to kill or warn off the attacker, to which Pistorius responded that he did not have time to think. "Your defense had changed. It is not self-defense, it is involuntary action," Nel said. "It's now 'I don't know why I fired.'" “I did not fire at Reeva,” cried Pistorius. The court adjourned several times to allow Pistorius, overcome with emotion, to take a break and collect himself. Nel suggested that Pistorius was becoming emotional not because of grief but because he got his defenses mixed up. Pistorius will face Nel again tomorrow, when questioning is likely to focus on Pistorius's actions when nearby the toilet.